Eating Disorders Facts about different types of eating disorders. Food Allergy Facts about food allergy, including the symptoms and signs. Gout Get the facts about gout, including the risk factors. Dr. Huy L Cao, MD is a Doctor primarily located in Rocklin, CA. His specialties include Family Medicine. He speaks English. Dr. Cao has received 1 award. The overall average patient rating of Dr. Huy L Cao is Good. Dr. Huy L Cao has been rated by 31 patients. From those 31 patients 22 of those left a comment along with their rating. The overall rating for Dr. Huy L Cao is 2.8 of 5.0 stars. A family practitioner is a doctor who specializes in caring for people of all ages, at all stages of life. Rather than focusing on the treatment of one disease or patient population, family practitioners are often the doctors that people see for their everyday ailments, like cold and flu or respiratory infections, and health screenings. When necessary, family practitioners will provide referrals for conditions that require the expertise of another specialist. The doctors may also provide physicals, inoculations, prenatal care, treat chronic diseases, like diabetes and asthma, and provide advice on disease prevention. Very professional, proactive and preventative-minded. Dr. Cao emphasizes his patients are active participants in maintaining their own positive healthcare. My employer changed coverage with UCD, or I would still be his patient. We've been with Dr. Cao for over 5 years. Three of our children have involved medical needs. He and his assistant always follow up with specialists to make sure the kids receive necessary appointments, treatment, and supplies. He has been very supportive of our medical decisions, even if they differed from what he suggested. We've also referred him to friends and family members too. Worst doctor I have ever had ! Rudest doctor ever! Did not listen, interrupted, never scheduled return visits to discuss test results, did not take concerns seriously, seemed more concerned about being right than offering explanations, turned his back and walked out the door without an answering questions. As always Dr.Cau always has same day service with no waiting times because of the his business model and respect for his patients. I have full confidence in his abilities to be our no-nonsense Dr.for our family of four. Been a patient for about 17 years now. 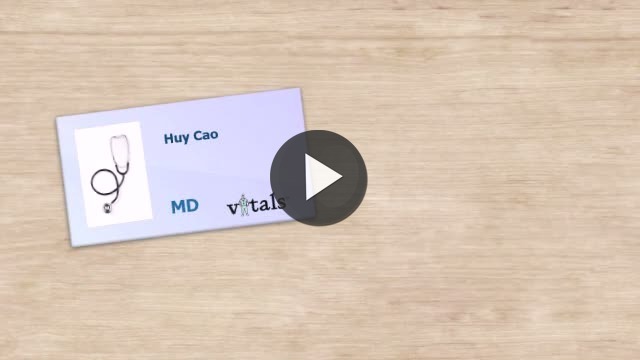 Take a minute to learn about Dr. Huy L Cao, MD - Family Medicine in Rocklin, CA, in this video. Dr. Huy L Cao is similar to the following 4 Doctors near Rocklin, CA. Have you had a recent visit with Dr. Huy L Cao? Select a star to let us know how it was.